Well, I can officially say that the green machine has made it all the way across the country. I started at the Hudson River and made it to the Pacific Ocean. Saturday night I made it from Portland to the coast in southern Oregon, and Sunday I did the rest of the drive down to the San Francisco bay area. I took the scenic route along highway 101 for almost the whole way, which is several hours slower than I-5 but a lot more interesting. 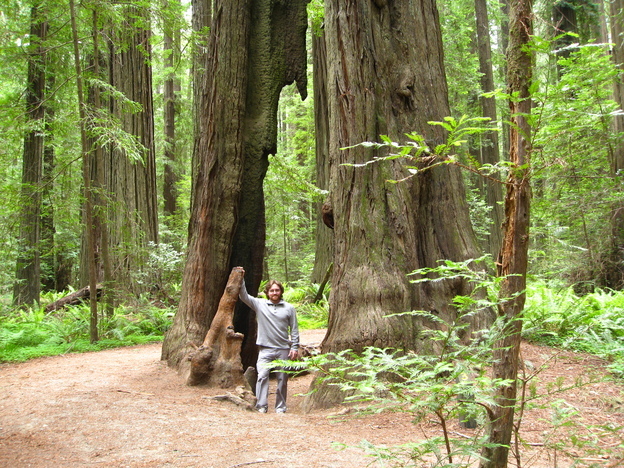 I also took a side trip into Humboldt state park to check out the giant Redwood trees. This week I'm in Sunnyvale for week and I'll be heading down to L.A. on Saturday. Previous page Flaming Vegan Doughnuts! Next page The sound of green silence!